This is fourth of a series on "how to make knitting stitches." 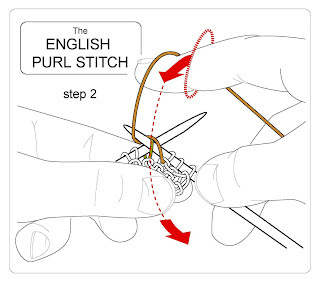 Previous in this series are "The English knit stitch," "The continental knit stitch," and "The continental purl stitch." Please excuse the delay: the original drawings for this post were corrupted and it was d**ned annoying most discouraging to have to start over again. However, my friend and neighbor J.A. came over, and her hands are the model for the new drawings here, so thanks J. (Above) Hold the standing yarn (standing yarn=yarn coming from the ball) in FRONT of the work. Keep it under tension with the first, third and fourth fingers of the right hand. 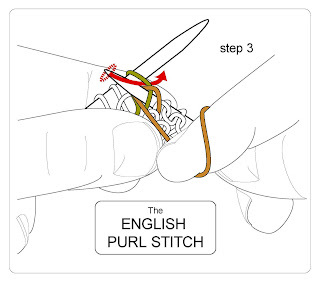 Insert the right needle under the RIGHT arm of the "old stitch" at the tip of the left needle (green). Be sure the right needle passes IN FRONT of the left needle, as illustrated. 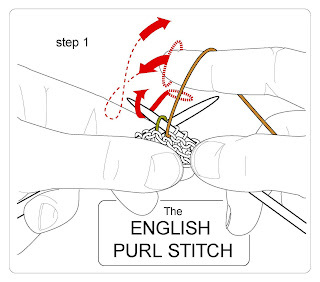 "Dip" the right forefinger (dotted red arrows) to wind the standing yarn (brown) around the right needle (solid red arrow). (Above) Once the standing yarn (brown) is wrapped around the right needle, swing the right forefinger down towards the floor. Dotted red arrows. This "locks" the standing yarn around the right needle. (Above) Draw the right needle -- with the standing yarn (brown) "locked on"-- through the old stitch (green) from front to back. Solid red arrow. 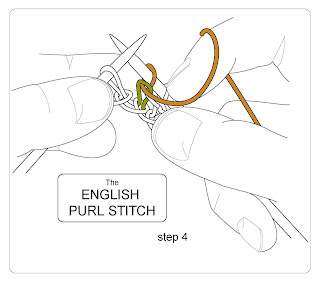 (Above) Once the new loop (brown) is drawn through the old stitch (green), withdraw the left needle, and you will have a purl stitch waiting on the end of your right needle. Remember to draw the right needle to the FRONT again (as in step 1) before inserting it into the next old stitch on the left needle.